Maryland CPA firms once again are rising to the top of the profession. 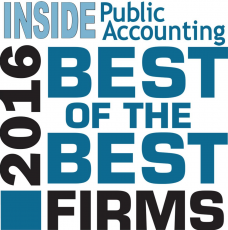 Not long after Accounting Today named 10 Maryland firms among the nation’s best firms to work for, INSIDE Public Accounting has included a pair of Maryland firms on its “2016 Best of the Best Accounting Firms” list. Rosen Sapperstein & Friedlander, LLC, of Owings Mills, was named to IPA’s overall “Best of the Best” list, which included just 50 firms throughout the nation. Wagner Duys & Wood, LLP, of Bethesda, was named one of the 10 “Best of the Best” firms under $5 million in net revenue. The “Best of the Best” firms are “recognized for their overall superior financial and operational performance on more than 70 IPA criteria,” INSIDE Public Accounting states. “The right combination of planning, strategy and execution distinguish ‘Best of the Best’ firms from among more than 540 firms that participated in IPA’s 26th annual Survey and Analysis of Firms. Read the complete list of IPA’s “Best of the Best” here.